The southern black forest attracts with sunny valleys in the west, picturesque towns and the highest mountains. Freiburg im Breisgau, on the southwestern edge of the black forest, is an attractive city. Breathtaking scenery awaits you everywhere, whether you drive along the main highways, or on the smaller side roads. 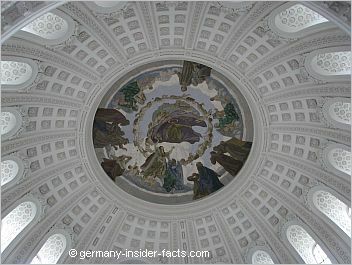 So it is no surprise that the central part of the southern black forest is called "Hochschwarzwald" (high black forest). The Südschwarzwald is bordered by the Rhine in the south, the river also builds the border to Switzerland here. Once the Rhine changes its course northwards, it builds the border with France. The mild climate of the Rhine valley influences the climate of the western slopes of the black forest as well. Join me on a few round trips through stunning landscapes. If you have some time to spend in the area, take a break and stay in one of the picturesque towns and spa resorts. Find a map on the bottom of this page and links to check out hotels for each town along the route. What else do you need to plan a fantastic vacation in the southern black forest? Leave Freiburg on the Bundesstrasse 31 (national highway 31) to the east. The narrow Höllental between Kirchzarten and Titisee is a highlight on this route. Kirchzarten (population 9600) in the valley of the Dreisam offers activities like mountain biking, hiking, rock climbing. A school for paragliding and hang-gliding let you experience the landscapes from a bird's eye view. Tandem flights are available. Höllental (valley of hell) is a 9km long valley surrounded by mountains and rocky outcrops up to 600m high. Hirschsprung is the narrowest part, note the statue of a deer on top of a rock. It is said that a deer once leapt over the valley, certainly before rocks were blasted and the valley was made wider to construct the road. The serpentine road winds uphill to Höllsteig and Hinterzarten. Don't miss the detour from Höllsteig to the Ravennaschlucht, a narrow side gorge with the imposing Ravenna viaduct. Hinterzarten (population 2600), the climatic healt resort (Luftkurort) calls itself perl of the black forest. Indeed, the town offers wellness & health services, wintersport activities including the Adler ski jump centre. Famous ski jumpers, Sven Hannawald, Georg and Dieter Thoma are locals of Hinterzarten. The black forest ski museum, a toy museum and a museum of agricultural engineering tell about the history of the region. Titisee-Neustadt (population 11,700), once two separate towns, the original Titisee is located north of the lake with the same name. Neustadt, the administrative centre, is 5km further to the east. 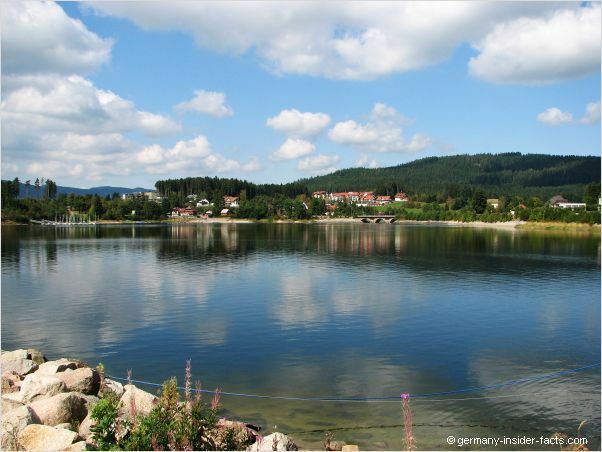 Lake Titisee is about 40m deep, although a local legend says that the lake is of unmeasurable depth. If someone tries to detect the depth a voice says "If you try to measure me I will swallow you". The lake is a paradise for watersports in summer. During strong winters the locals hope and wait that Titisee freezes, although this takes quite some time. The government declares zones on the edge to be safe when the ice is more than 16 cm. East of Titisee-Neustadt the B 31 leaves the Hochschwarzwald, passing the historic towns Löffingen and Hüfingen. Donaueschingen (population 21,100) is located on the Baar plateau on the eastern edge of the black forest. The main attraction is the Prince of Fürstenberg palace with a lovely garden and the Danube source. If you don't want to drive to Donaueschingen but stay in the Hochschwarzwald, go down south from Titisee on the B 315. It is less than 20km to reach the Feldberg pass (1,231m). For those visitors who travel by train in Germany, the Höllentalbahn will take you to all towns on the described route. This is another lovely route to reach the Hochschwarzwald. Schauinsland - It is a leisurely drive up a serpentine road to Freiburg's "house mountain". This 12km winding road has been used for speed hill climbing races, so you can race a little bit as well. Stunning views over the black forest, Freiburg, the rhine valley and to the Vosges in France reward you on the summit. Don't have a car? Take Schauinslandbahn, a gondola lift, from Horben. The lower station can be reached by tram and bus from Freiburg. Visit the museum mine, the largest silver mine in the black forest. You need sturdy shoes and warm clothes as the temperature in the mine is +8°C all around the year. Tours take 1 1/2 or 2 1/2 hours. Todtnau (population 4900) is the cradle of alpine skiing in Germany. A chair lift takes you on the 1158m Hasenhorn mountain. Attractions are Germany's longest tobaggan run, a mountain bike course, and the waterfall (97m) between Todtnau and Aftersteg. Feldberg (1493m) is the highest mountain in the black forest. 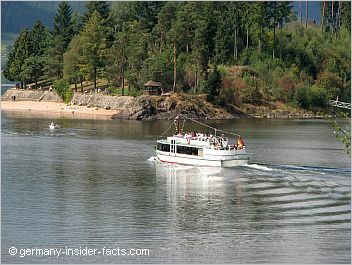 It is located between Titisee-Neustadt and Todtnau. The area is a favourite destination for hikers in summer, and skiers in winter. 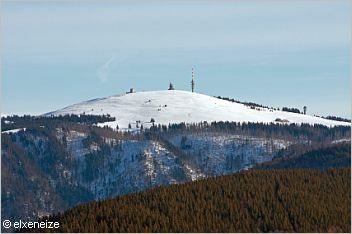 Seebuck (1448m) is the second highest peak, only 2 km from the Feldberg summit. Hotels along the Feldberg pass road and huts on the walking trails in the Feldberg region cater for visitors. Schluchsee (population 2600) is a small town on the shore of the lake with the same name. Schluchsee was a glacial lake, however, the river Schwarza was dammed to built the much larger reservoir. Nevertheless, Schluchsee looks quite natural. It is a favourite spot for swimming and sailing. There is a 18km walking trail around the lake, but you can cut the distance by taking the boat that crosses the lake during summer. The three lakes railway line runs from Titisee along the eastern shore of the lake to the village Schluchsee and to Seebrugg on the southeastern tip of the lake. 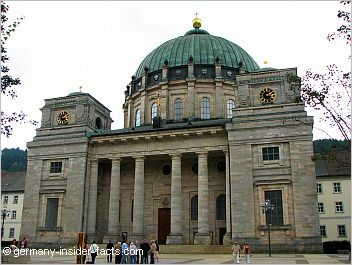 St. Blasien - The former Benedictine monastery with its impressive dome is only a short detour south of Schluchsee. The Kolleg St. Blasien, a catholic secondary and boarding school has its home in the monastery since 1934. Did you find a city/town you want to visit for a couple of days? Are you wondering where to stay? Use the search tool to find hotels in the black forest. Compare the major online booking services, book at the best rates. Staufen im Breisgau (population 7600) is a lovely historic town at the entrance of the remote Münstertal. As you drive up the valley towards the Hochschwarzwald, you pass the baroque Benedictine abbey St. Trudpert. Further up the Münstertal a side road winds it way up to the summit of the Belchen (1414m). When the weather is particularly clear, there are chances that you see the peaks of the Alps to the south (most likely in winter). The road finally meets the B 317, decision time. Turn left to go to Todtnau and the Feldberg. Turn right to drive to Badenweiler via Schönau. Badenweiler (population 3900)- with more than 1700 hours of sunshine a year, surrounded by lovely landscapes, Badenweiler truly has a mediterranean flair. Warm mineral springs, the fantastic Cassiopeia Therme, the spa gardens, these are only a few of the many attractions of Badenweiler. The town is a place to relax and refresh your batteries. Allow yourself wellness treating in beautiful surroundings. Blauen or Hochblauen (1165m) is located southwest of Badenweiler. The views from the lookout tower are breath-taking. Here is a map of the southern black forest to help you plan your trip to this most wonderful part of Germany. Looking for a map that you can take with you on your travels? The Michelin Southwest Map 545 covers Baden-Württemberg and the black forest. Although it is easier to travel by car, you can also reach many destinations by public transport (train and bus). Check out bahn.com for train connections and tickets.